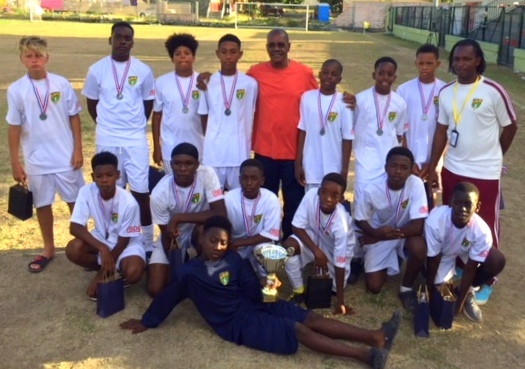 BVI Football Association » The National U14 Squad returned from a four team Tournament in St Maarten over the weekend of May 18th – 20th, with the runners up trophy tucked proudly under their arms. Despite having lost their first two games, to a very strong and fit St Maarten and Martinique teams, the Boys rallied to beat eventual Champions, the USVI 2- 0. Day two began with an upset when the USVI beat St Maarten on penalties in the first semi-final. Then, the BVI played their hearts out in the next semi-final against favourites Martinique. It was mighty versus the young underdogs. BVI got an early first goal which put the favourites on the back foot and the BVI then endured shot after shot until Martinique equalized just before half time. The 2nd half was all about defence and the Boys managed to hold on to a draw and then move onto a nail biting penalty shoot, which the Boys won! Whatever Coach Manley said at half time, certainly had the desired effect as the Boys went on the offensive. It was still 2-0 with less than five minutes to go, but then following a series of corners the USVI began to wilter and a defensive area led to a penalty, which was coolly converted by Sheldon Toney, who only 2 hours ago was in the back of ambulance on the way to the hospital to get his ankle checked out. The BVI were done yet though and with the ref’s whistle on its way to his mouth, another corner flew across the USVI box and Denvin Jones rose high to nod home the equalizer. The whole weekend was filled with highs and lows and it did not stop there, as the tired legs and exhausted minds tried to raise themselves up over one more hurdle. However, it proved one mountain too many and the USVI ran out 4-2 winners.